All Aboard For A Three and a Half-Hour Tour! 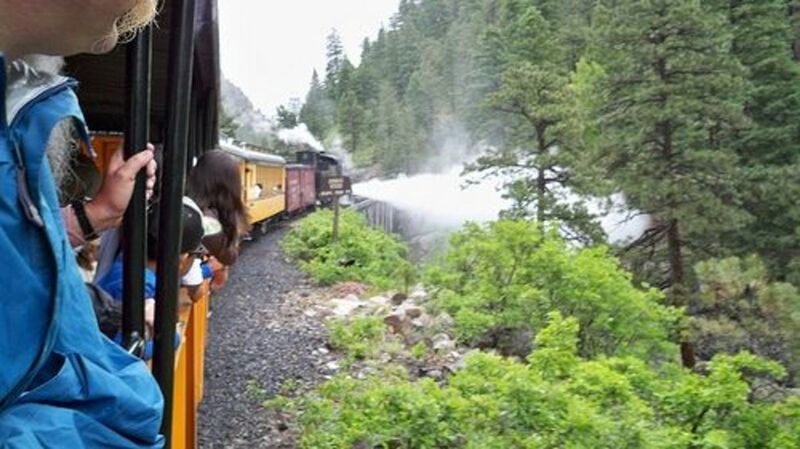 On a trip to Colorado, my husband and I took a ride on the Durango-Silverton Narrow Gauge Railroad, using the train as a fun way of shuttling from one end of our Colorado Trail section-hike to the other. We'd wanted to ride this historic, scenic train through the San Juan Mountains for years, and we weren't disappointed. What a great trip! Here, I'll share some of my own photos, a little history of the "DSNGR," a description of the route, the various seating options and amenities you can choose from, and a few suggestions for making the most of the experience. The term refers to rails that are three feet apart. By comparison, standard gauge rails are 4 feet, 8-1/2 inches apart, based on Roman chariot wheels. 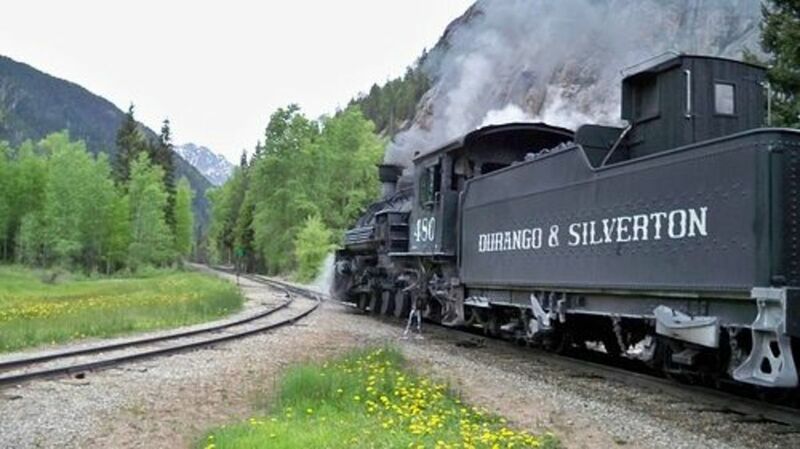 The Durango-Silverton Narrow Gauge Railroad first came to Durango, Colorado on August 5th, 1881, two years after the Denver & Rio Grande Railway founded the new town. Intended for hauling silver and gold from the surrounding San Juan Mountains, construction on the line to Silverton began just a few months after the railroad arrived. By July, 1882, the route was completed, and the train began moving both freight and passengers between the two towns. 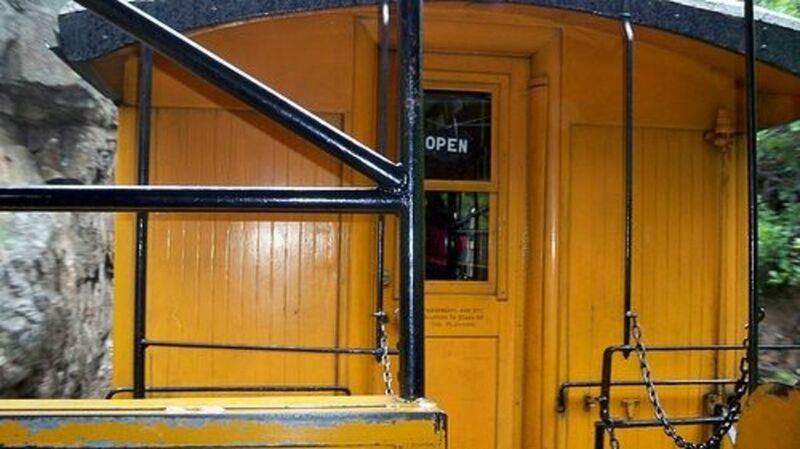 The DSNGR and its steam engines have now been in continuous operation for 127 years. The completely coal-fired and steam-operated locomotives are 1923-25 vintage and maintained in their original condition. 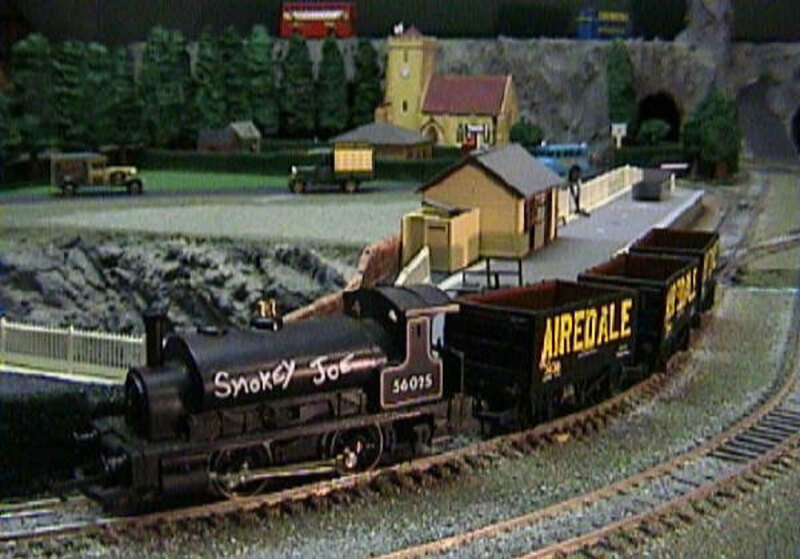 For a round trip, a "fireman" shovels six tons of coal, and 10,000 gallons of water are used to produce the steam to power the train! I know, not the most complimentary of statistics. But the train's whistle sounds quaint, anyway. Toot, toot! 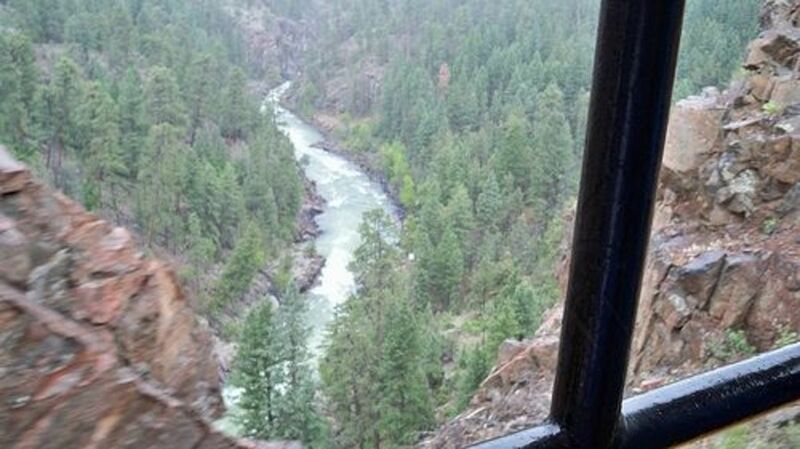 The train travels 45.4 miles along the Animas River during the summer season from May through October. On winter trips from late November through early May, the train runs 26 miles from Durango to the turn-around at Cascade Station and back. From May through October, you can board the DSNGR at several points, including the small, fun city of Durango at an elevation of 6,512 feet or tiny, historic Silverton at 9,305 feet at the other end of the line, or the wilderness access points at Needleton and Elk Park. There is now also the option of getting off and later back on the train at Soaring Tree Top Adventures, where you can zip line your way through and above the aspen trees or fly from platform to platform on spans ranging from 50 to 1400 feet over a distance of more than a mile. (There is no road access to this location.) I missed a great photo, by the way, of a kid zipping through the trees past the train -- upside-down -- when my camera got hung up in my pocket. 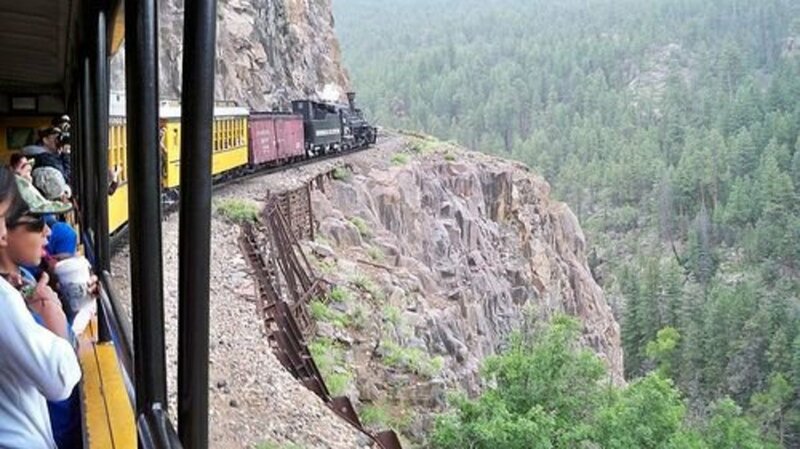 Anyhow, at one point along the train's route, the tracks literally take passengers along a cliff, hundreds of feet above the Animas River rapids. Hey, see that kid in the photo above — the one drinking from the red straw? He was the one who kept leaning over and spitting out the side of the gondola. Thing is, the spray kept blowing back at me! His mom saw but didn’t seem to care, so we moved to the other end of the car. Yuck! The train stops a couple of times to load up with water for the engines. 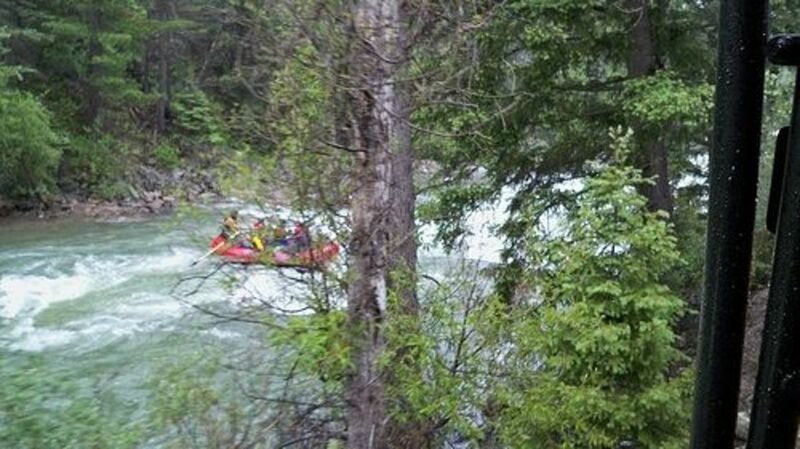 You’re constantly in sight of the Animas River along the entire route, so keep an eye out for rafters and kayakers. That looks like quite a ride, too! The train crosses the river five times along the way, so you’ll have lots of great views of the Animas from either side of the car. The quiet town of Silverton comes alive when the train arrives, offloading more than 200,000 people each year, often for a stay of no more than a couple of hours. 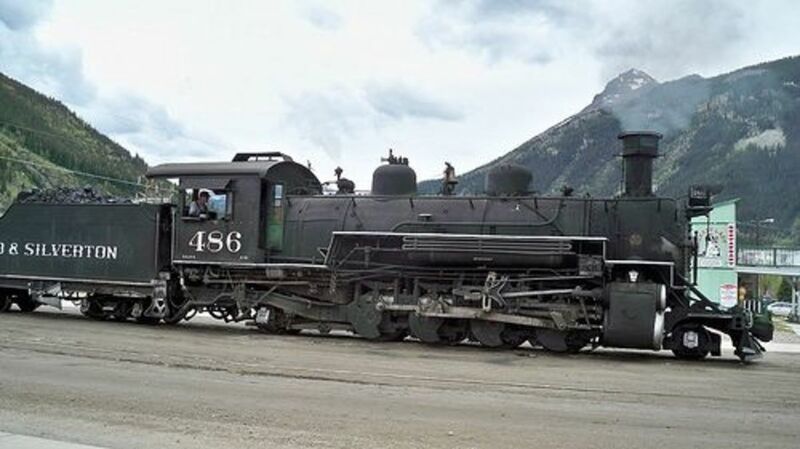 At the start of our trip, when we rode the train from Silverton to Elk Park, we got all excited when we heard the steamy whistle blow just outside of town, well before we saw it when it rounded the corner onto Blair Street. 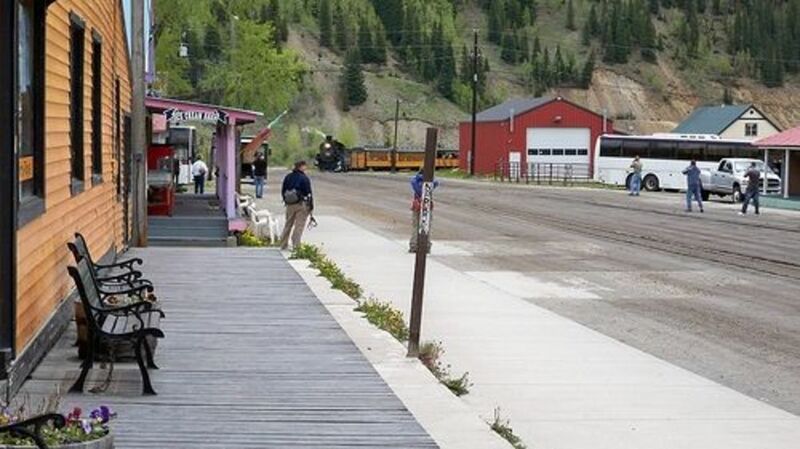 There is no train station in Silverton. The tracks simply lead down the unpaved road, stopping just before the crosswalk. These are wilderness points where the train will stop to let hikers get on or off. Not all DSNGR trains are scheduled for allowing pick up and drop off at these locations, so refer to the online time table for those dates and times. If you're really afraid of heights, I still wouldn't pass up this ride, which is very safe (I think). The majority of the route really is down at or near the bottom of the narrow valley. If you’ll be riding in one of the open-air gondolas, you’re sure to get covered with bits of soot and cinder from the coal-fired steam engine, so I’d recommend against wearing anything you wouldn’t want to get grimy, like white pants for instance. Also, bring along eye protection. It’s not like you’re constantly getting pelted, but without eyeglasses, sunglasses or safety glasses, you’re almost sure to get irritating particles in your eyes. They do sell safety glasses on the train if you forget yours. 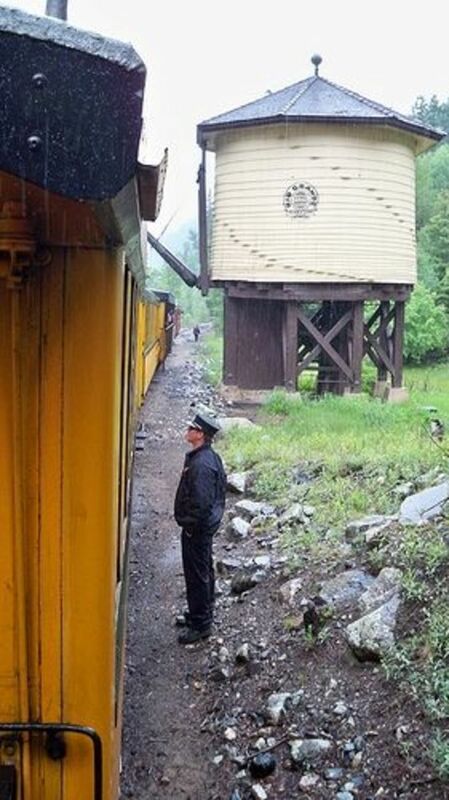 Even in late June, our train ride from Durango back to Silverton was very cold and unseasonably wet. What began as t-shirt weather in Durango soon became fleece, rain jacket, hat and gloves weather as we climbed and the clouds rolled in. So be sure to bring along some layers and maybe even a blanket if you’ll be riding outside at all. The train goes slowly — it’s top speed is 18 miles per hour, which it rarely seemed to reach — but there’s still enough added breeze to create significant windchill. Also, if you don’t want to spend extra dollars on the train, you might bring along drinks and munchies like we did. And, by gosh, don’t forget your camera! 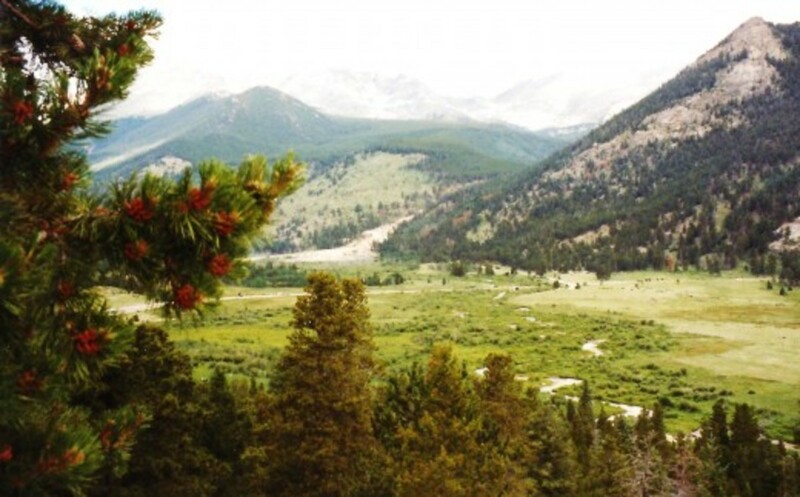 This stop gives hikers access to the Colorado Trail, which runs 482 miles from Denver to Durango, the Elk Park Trail to the Continental Divide Trail, and the Vallecito Creek Trail. The latter can be connected with other trails to create a difficult, 34-mile loop back to the town of Needleton. This short stop gives hikers access to the Chicago Basin, including the Needle Creek Trail, the Johnson Creek Trail and the base camp for mountain climbers. The three tallest peaks in the area are 14,059-foot Sunlight Peak, 14,084-foot Mount Eolus and 14,087-foot Windom Peak. For your ride, you have the choice of several "classes" of cars and service, from the standard (aka economy) class in the open-air gondolas and vintage coaches, the latter with windows that you can open, to the cushier "deluxe" class, the stylish "first class" with its complimentary pastries and beverages, and the private "presidential class." 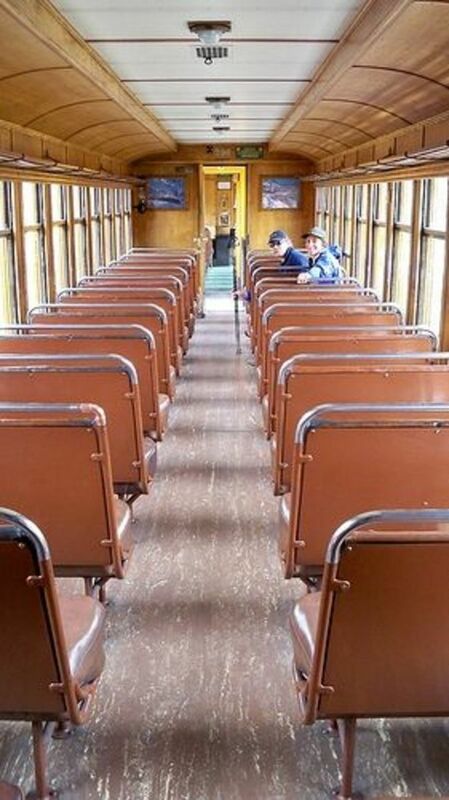 Pictured here is the interior of a standard vintage coach (before most of the passengers had boarded). And this is a gondola. There are padded bench seats, which face towards either side of the car. On a nice day (and even on a not-so-nice day), this is where I’d want to be, cinders or not. There’s also a concession car on the train. We brought along our own lunch and drinks for the ride, but we heard about an endless cup they sell–I think it’s around $6–which you can have continuously filled with whatever you’d like to drink, cold or hot. And you can keep the cup and bring it back with you if you ride the train again and continue to get those free refills. I saw several folks have quite a few hot cocoas and coffees on our trip. And, yep, there are bathrooms aboard the train, too. To board the train at the Elk Park or Needleton short stops, you should wave your hands horizontally across your knees. When flagging the train to go in either direction, you need to be on the east side of the tracks. Prices range from $81 to $179 per person for adults, with a season pass now available for $139 for adults and $69 for children. In addition to unlimited rides throughout the year, season pass holders also get discounts on special events, like the New Year's Eve, Valentine's Day, Independence Day, Cowboy Poet, and Photographer's Special trains. **It's noted on the website that there is a $10 charge per backpack (I mean the big, hiker kind, not the small day packs many people carry), but there was no mention of that charge when we made the reservation or got on the train, and we were never assessed the baggage fee. We were not, however, allowed to hang onto our packs during the ride. They were placed in a different car and handed down to us when we got off. Also, if you'd like to make it a round trip (or semi-round-trip like ours) but return on a different day, that's no problem. Our ride from Silverton to Elk Park was a week before our ride from Durango back to Silverton. In addition, there's the option of making a return trip by motor coach instead of taking the train back. 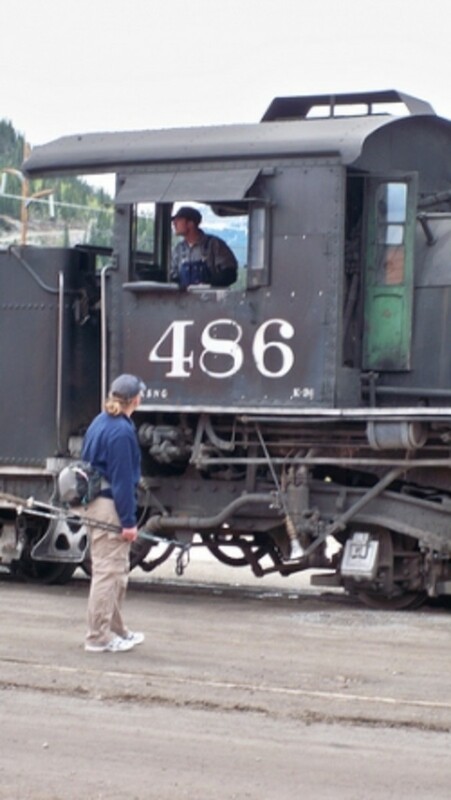 Take A Virtual Ride On The Durango-Silverton Train - This is a winter trip, so dress warmly! One thing I noticed in this video is that the flow of the Animas River is MUCH lower than it was when we took the ride in June. At that time, the river was running fast and furious. In the winter, the train departs Durango and then does a turn-around before Silverton, due to heavy snows at the higher elevations, so you'd begin and end at the same place. 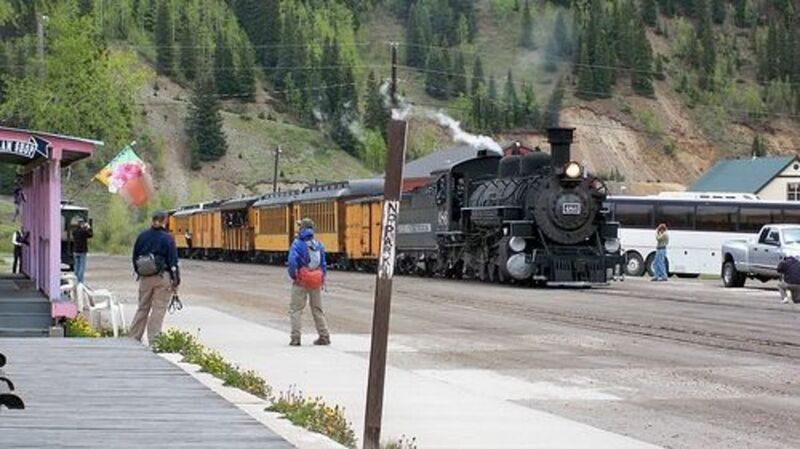 The Durango-Silverton Train provides wilderness access and pickup for hikers on the Colorado Trail. We used the train as our means of shuttling when hiking the CT between the two towns. At the beginning of our trip, we boarded the train at Silverton and rode it to the "short stop" at Elk Park near the trail crossing to start our hike. 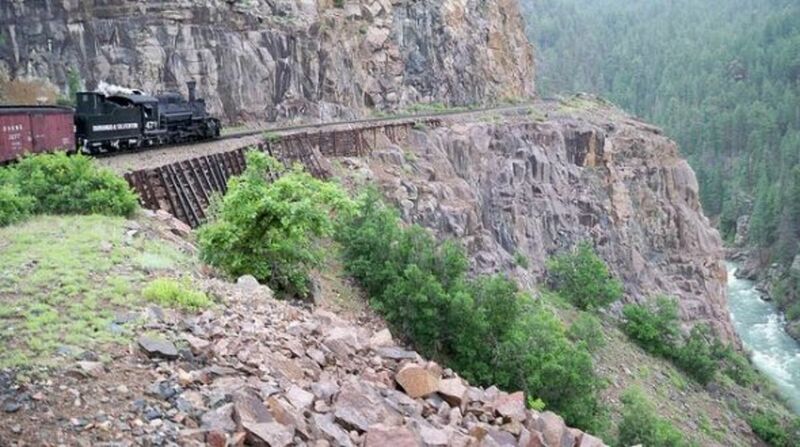 At the end of the trip, we rode the train from Durango back to Silverton where our car was parked. Comments & Questions Welcome - Have you ridden on the DSNGR? Looks super fun! I love trains and heights. Perfect combo for me. Nope. I love the lens! 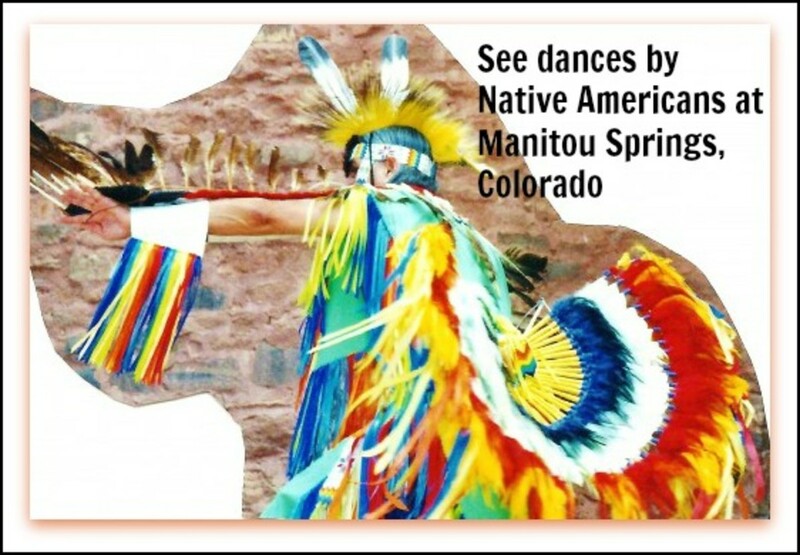 I'm featuring it on my lesson plan on Colorado: https://hubpages.com/education/colorado-lesson-pla . Thank you for the great resource! Definitely a must-do trip for anyone visiting Colorado! Nothing like that here in Boulder, CO, but that train ride is worth the trip. Great post. 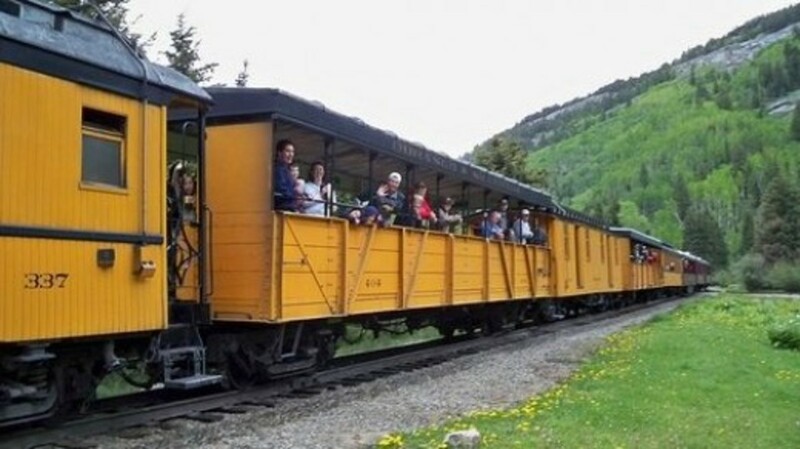 I have always wanted to take this ride but so far the Georgetown Loop is the only train ride I have taken. 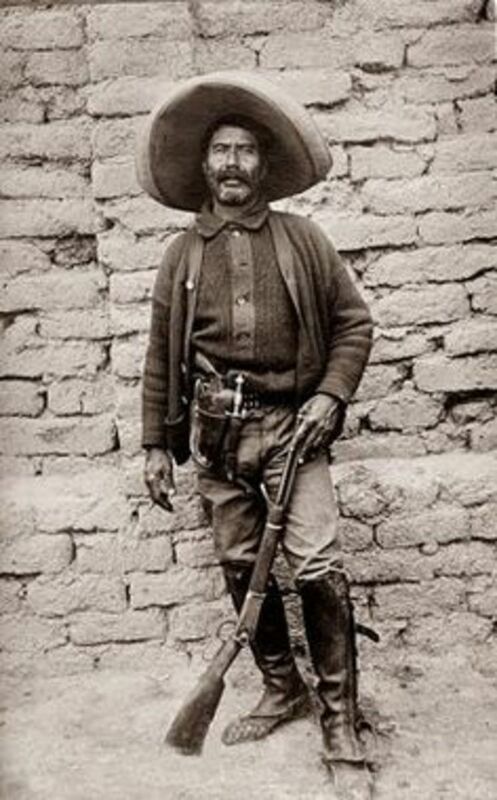 I love your pictures and now you have me thinking about planning a trip to Durango! Rode it both ways! Great ride through some of Colorado's finest scenery! If you haven't...you've go to! Great lens! Just got back from a wonderful train ride to Silverton Colorado! Very informative article! Oh my! This was really a memorable train ride, even virtually Lensrolling to my Palmetto Live Steamers Club.. Truly beautiful pictures in this lens. I think I'll feature this one. What a great lens. We need to take this ride. Thanks for sharing this info. You have so many great lenses. I am going now to visit others. I truly felt like I went on this ride with you...your gift for writing as though you are talking 'to me' is wonderful. The pictures are spectacular...actually breathtaking! Thank you for sharing this lens and your trip for all of us to enjoy! Rolled over to my new lens about Fun and Romantic Train Excursions. The train ride was a great idea. I had a really good time, too. It would be fun to do it again when it was really warm and sunny out, when we could see those highest peaks.